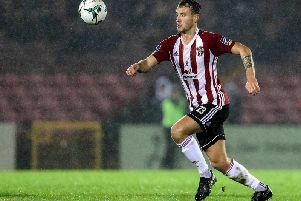 The midfield playmaker completed a short term loan deal this afternoon and is expected to be involved in Derry City’s pre-season fixture against Glentoran at the Oval this Friday. A product of Aberdeen’s youth system, the 25-year-old was signed a three year deal with SPL side, Dundee in 2015. He will join the ‘Candy Stripes’ in an initial loan deal which will keep him at the club until this summer. However, Shiels, who is familiar with the player from his time as manager of Kilmarnock, is hopeful of extending that deal and secure his services for the entire 2017 season. “He gives us depth in the middle of the park which we haven’t had since Conor left. “He’s a similar type of player to Conor McCormack, same size, same model only left sided. He’s a good player. I’ve known him from my time in Scotland.